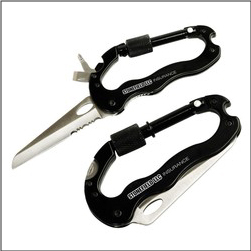 Order Custom Carabiners with a Pocket Knife and additional tools included within. Approx 4inches x 3 and 3/8inches. Great for camping, hiking, fishing, with combination straight and serrated blades, locking clip, as well as phillips and flathead screwdrivers. Imprint front and back as needed. Order your custom carabiner tools imprinted with your logo or business today!